Ask any musician about his or her musical influences, and more often than not, the name Bob Dylan will pop up in the conversation. A true artists’ artist, Dylan’s famous fans range everywhere from his AmericanaramA companions Jim James and Jeff Tweedy to Ke$ha, and everywhere in between. It only makes sense that a few of these artists would commemorate Dylan by performing at a music festival in his honor, and it only makes sense that this celebration would be called Dylan Fest. Dylan Fest, presented by The Best Fest, will be a night for Bob Dylan fans, famous or otherwise, to celebrate Bob Dylan’s music. The festival will showcase Nick Valensi and Albert Hammond, Jr. of The Strokes, Fran Healy of Travis, Bell X1’s Paul Noonan, Gemma Hayes, Boz Scaggs, Jape, Conor & Neil Adams from Cast of Cheers, Butch Walker, James Vincent McMorrow, Heathers, Cathy Davey, Gavin Friday, Ruby Amanfu, Jerry Fish, Danny Masterson and more. The Best Fest, sponsored by Jameson Irish Whiskey, has hosted events in the United States for over ten years – notably Dylan Fest, Petty Fest, and Stones Fest. 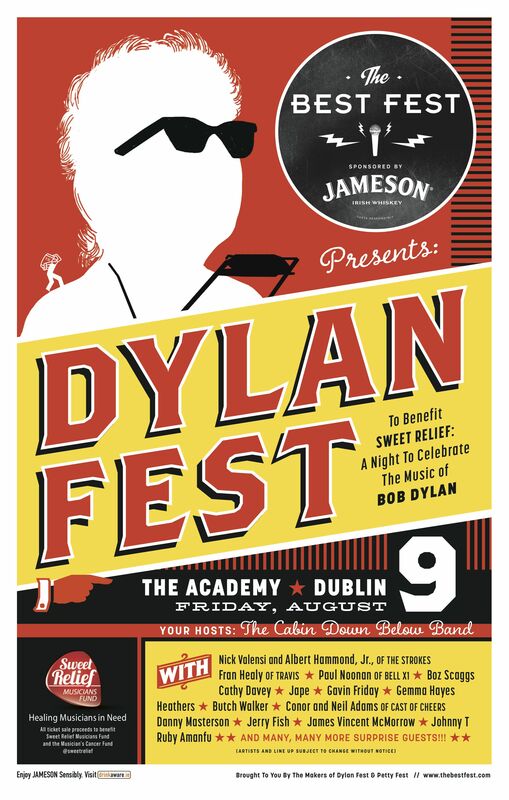 This year Dylan Fest will (rather appropriately) travel to Dublin, Ireland on August 9, marking The Fest’s first trip overseas. Tickets are on sale now. All of the proceeds will go directly to Sweet Relief Musicians Fund, a charity dedicated to helping musicians who are struggling financially due to illness, disability or age related problems.